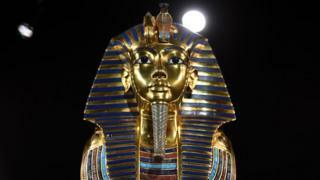 Egyptian officials now say they are "90% sure" that there is a hidden chamber in King Tutankhamun's tomb. The Antiquities Ministry said it had carried out scans to gather more information about the theory. Archaeologist Nicholas Reeves believes Tutankhamun's remains may have been rushed into an outer chamber of what was originally Queen Nefertiti's tomb. "Clearly it does look from the radar evidence as if the tomb continues, as I have predicted," Dr Reeves said at a press conference with the Egyptian Antiquities Minister Mamdouh al-Damati on Saturday, AFP reports. "The radar, behind the north wall [of Tutankhamun's burial chamber] seems pretty clear. If I am right it is a continuation - corridor continuation - of the tomb, which will end in another burial chamber," he said. Mr Damati said the scans would now be sent to Japan for further analysis.